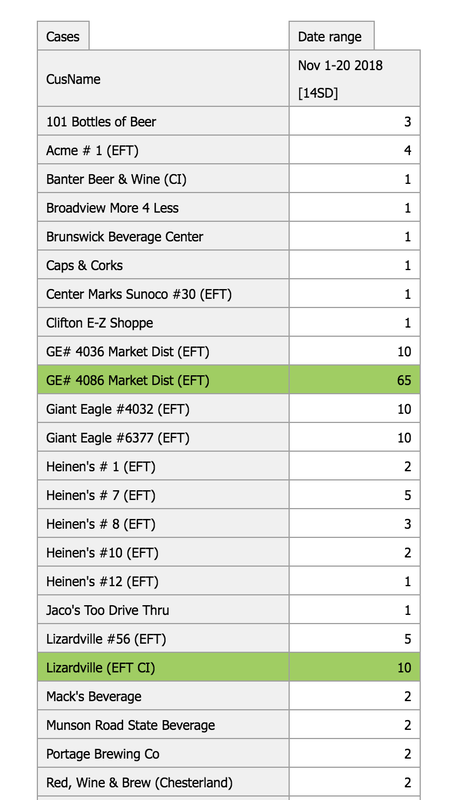 So Cleveland had a pretty robust craft brewery scene. They have a passport thing where if you visit so many breweries you get a prize. I love passports, and I love breweries. Boom. Popped into the Fat Head Brewery Beer Hall. Brandon kept saying "oh I think that's fat head!" at every fat guy in the place. I think that they were just your garden variety, non-famous fat people though. Lydia went for a Bumble Berry honey blueberry ale that came with berries floating in it. So there's a particular beer at A-B which is my favorite and is the nectar of the gods: Goose Island Bourbon County Stout. It's made in limited quantities, is released on Black Friday, and sells out promptly. This presented a challenge because I knew where the go-to places to get this nectar of the gods would be in St. Louis, but I had no idea where to go in Cleveland. 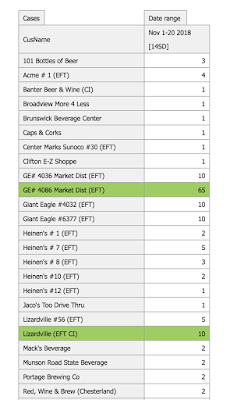 Luckily I planned ahead and talked to a guy in the office who hooked me up with a whole spreadsheet of how many cases were going where in the Cleveland area. There were a couple of hotspots on our radar. First one was the Market District supermarket in Strongsville. We went there and they were sold out of everything but the basic flavor. Sad. I must have been on tilt at this point because on our way out of Strongsville I got pulled over for speeding. Once the policeman saw what an attractive motorist he was dealing with he let me go with a warning. I knew fun stuff was still happening at the Lizardville liquor store because there was a line wrapped around the building. Having three people in our party meant we were able to crush it here despite the per-person limits. This stuff was not cheap. The most expensive bottles were $25. Worth it! Not only did I get the beer but I got to blow up my friends at work who didn't get all the good flavors. The shame of one's coworkers is truly priceless. We had a couple flavors on draught while waiting in line. It was truly a Bourbon County day. Back at home base we munched on Thanksgiving leftovers. The local Cleveland wildlife also seemed to be eating irresponsibly. 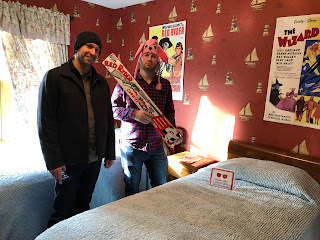 The airbnb was supposedly within walking distance of the A Christmas Story house, and we tested that theory by... walking there. They cunningly made you buy tickets while inside the giftshop. There were leg lamps of all shapes and sizes. It was $12. I thought that was a good investment. So the house is the same house used in the movie. But it was only used for the exterior shots. So the areas of the interior that you can see from the exterior, like the living room, are legit but many of the upstairs rooms had to be remodeled to try and be as close to the movie sets as possible. A major award! The house was also fun because they explicitly announced that you could touch whatever you wanted. I appreciated that because it meant we could take better pictures and play around with the movie props. You'll shoot your eye out. Had to write that at least once. They even had some good hats you could wear while perusing. 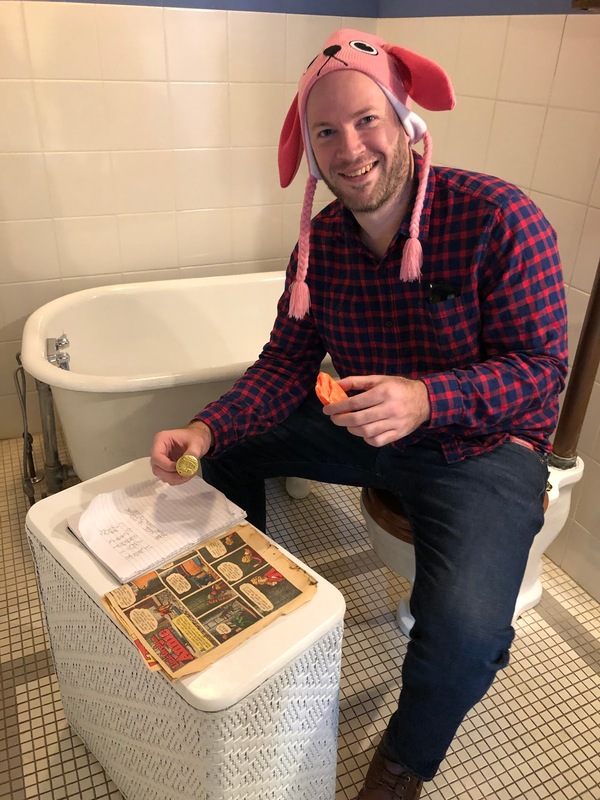 I did some multitasking by using my Orphan Annie Secret Society decoder pin while taking some soap licks for my potty mouth. They also owned the next door hillbilly Bumpus House that the 785 smelly hound dogs lived at. You could actually rent this place out and stay the night, which is awesome. We sort of continued our Christmas Story pilgrimage by traveling downtown and visiting the old Higbee department store. 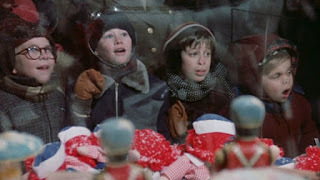 The creepy santa and elves scene from the movie takes place here, as well a scene at the start of the movie where the kids all smash their faces against the glass ogling all of the cool Christmas toys on display. I guess the Christmas displays are so popular that they somehow still exist despite the fact that the building is now a casino. I was pretty obsessed with getting stamps in my Cleveland craft brewery passport so we hit a few more. This place was aptly named Butcher and the Brewer. You can sort of see the deli meat part of the business back there behind the bar. I recall the bartender here being pretty snooty. A New England IPA on the menu was named "Well everybody else is doing it, so I guess we will too!". I found the beer to not be good enough for them to be this douchey. The Victorian era Arcade Cleveland was strikingly beautiful. The whole building was rented out for a wedding so this was as far as we got. What a nice place. I was also really impressed with Cleveland's main public library. I found myself comparing Cleveland to St. Louis a lot on this trip. I haven't been to that many rust belt cities beside St. Louis, and both cities have about 300K people in the city proper and ~3M people in their wider census area. I was a bit jealous of their downtown compared to ours. I'm not sure why but it felt like more of a big city's downtown, almost like Chicago. How much of that is me just being more familiar with St. Louis, I can't say. Maybe St. Louis is just more spread out and not walkable? We could walk to multiple breweries downtown. We popped into Masthead Brewing. I thought it was cool that all of the blank cans were piled up everywhere. We went to an inordinate number of breweries on this trip. I was ready to do some eating and so I looked up "what's the most friggin' Cleveland food in the friggin' universe?" I like to curse in my Google searches so it knows I mean business. Anyway one of the most CLE frig foods out there is pierogi, the Polish potsticker. Now Lydia and I had recently feasted on some pierogi in friggin' Poland so we were down to clown. Brandon though? Scared. He kept crying that he doesn't like "mushy food". To be fair I think the ones he ordered were likely more mushy because he'd gotten his tears all over them. Sad. My philosophy is if it's a national dish then they must be doing something right. The pierogi at JukeBox were nice because I think they might have fried them, making them even closer to delicious potstickers. As is my people's custom, we took a thing from another country then blinged it out real nice. I can't imagine there's a lot of buffalo chickpea pierogi in the old country.